Some fashion models are fortunate enough to wear glam dresses and gowns, where the cloth tumbles into a beautiful cascade. Many noted designers use bolts and bolts of fabric to get gorgeous hanging folds. Don’t draw little curves at the hemline of a dress and expect them to look like folds. Choose a few key folds and follow their form from where they begin down to the hemline for good fashion results. Graceful folds in soft or light fabrics originate from a focal point like a bodice, a sleeve, or the back of the dress and follow the line of your fashion figure. 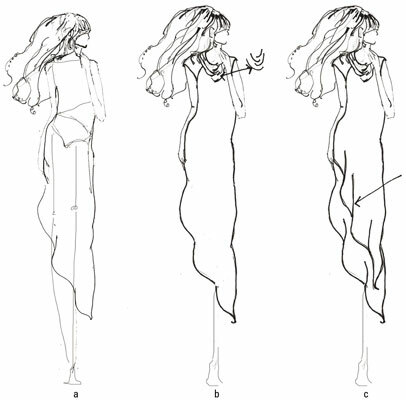 Lightly sketch a fashion figure of a woman wearing an asymmetrical hem dress. Draw a few lines around the neckline in curved shapes crossing over and underneath each other. Draw two rows of curved lines for the hem. At the bend of each curve, draw a line going up to show the folds of the fabric. Give the fold lines a little bit of curve to convey the skirt’s movement. Soft and light woven fabrics can hug the body, but they often swirl and float away from the body when a fashion model is in motion. Lightweight knits hang in soft folds while also fitting around the body horizontally in small, snug folds. Stiff, heavyweight fabrics such as denim hang with large, rigid curves. Stiff, lightweight fabrics such as polyester or silk tafetta can fold with sharp angles and tend to take on a shape of their own, with somewhat soft folds and other sharp folds.